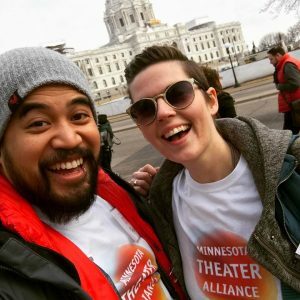 The Minnesota Theater Alliance, collectively founded by Minnesota’s theaters in 2010, is here to serve all theater and performance companies and venues of every kind, across the state. Did you know that there are over 460 theaters in Minnesota? The Alliance understands that each theater has unique hopes, needs, challenges, and successes to share. We prioritize listening to these stories and are actively working to develop and implement programs that connect our statewide theater community through audience development, shared resources, peer-based learning groups, advocacy and events. Every performance company and venue, of every kind: big and small; professional, community, academic, for-profit, non-profit, and unincorporated; urban, suburban and Greater Minnesota – all are welcome and invited. Most of our programs are open to all, regardless of whether you pay annual dues. Joining as a dues-paying member provides you with special member benefits, discounts, access to special events, and helps the Alliance build programs for all of us. We are a small institution, with a small staff, by design; our structure is driven by your needs, not by an arbitrary ambition to grow an institution. We promise to keep our expenses minimal and to spend your membership investment responsibly and responsively. Together, we can learn so much from each other and accomplish that which none of us can do alone, but it will take all of us to succeed. We welcome your support through becoming a member, volunteering on a program or event steering committee, and board representation. If you are interested in becoming more involved in the Alliance, contact us!